Live BBC Two coverage on 12 April from 19:30 BST and on 13 April from 18:00 BST. Live Red Button, online and mobile coverage on 12 and 13 April plus highlights, previews and reaction on 11, 12 and 13 April. Daily live text and radio commentary. England's Justin Rose has warned Masters debutants they face a steep learning curve at Augusta National when the tournament starts on Thursday. Ryder Cup hopefuls Stephen Gallacher, Victor Dubuisson and Joost Luiten are among those who have all qualified for the first time. Only three players have won a green jacket on their debut. Horton Smith and Gene Sarazen did so in the first tournaments (1934 and 1935) while Fuzzy Zoeller triumphed in 1979. "The learning curve at Augusta is steep, very steep," said Rose, the 33-year-old US Open champion, who has never finished outside the top 40 in his eight Masters appearances. Rose was tied for 39th in his debut and his best result at Augusta is joint fifth in 2007 behind American Zach Johnson. Although Scotland's Gallacher, France's Dubuisson and Holland's Luiten have performed well enough elsewhere to also be in line for Ryder Cup debuts in September, Rose believes just playing all four rounds in the Masters will be a worthy achievement. "I think the general rule is that if you make the cut the first time at Augusta, then that's a successful performance," he said. "Certainly that's how it was framed in my mind in 2003. "Just playing at Augusta is an amazing experience for any first-timer. It's an amazing experience going for the 10th time, to be honest with you. "It's one of the few tournaments where you play practice rounds even though you don't really need to. You already know the course and your strategy, but you can't resist getting out there on that golf course. It's a magical place and I can't wait to get back there." English amateur Matthew Fitzpatrick, 19, will also make his Masters bow after winning the US Amateur Championship last August. Gallacher, 39, effectively secured his place in the field by successfully defending his Dubai Desert Classic title at the start of February, although a share of sixth place in the WGC-Cadillac Championship last month confirmed it. 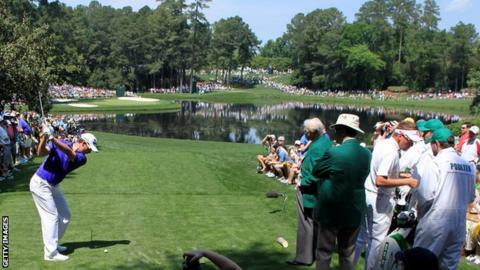 His best finish in a major is a share of 18th in the 2010 US PGA Championship, but he has already secured a practice round with 1988 winner Sandy Lyle to pick his fellow Scot's brains on the best way to negotiate Augusta's unique challenges. Gallacher is also trying to arrange some time with two-time champion Jose Maria Olazabal, who was the last European to win the Masters in 1999. Dubuisson, 23, leads the European Ryder Cup rankings, while Luiten, 28, won twice on the European tour last year. In the absence of the injured Tiger Woods, Rory McIlroy is the bookmakers' favourite, although the former world number one's best finish at Augusta remains his share of 15th in 2011. He held a four-shot lead going into the final round but collapsed to a closing 80.